Back when TechyDad and I were distance dating, we used to meet up at an outlet where they had a place that specialized in candy coated caramel or chocolate covered gourmet apples. We used to split them and they were amazing. The place has long since gone out of business and nobody around here does anything like that. Thanks to MomImpact, I now know about Mrs. Prindable’s. When I was asked if I would like to try one of their apples I immediately said yes. Mrs. Prindable’s starts with a handpicked, extra-fancy apple, grown especially for us. Delivered fresh from the orchard and with the utmost care, it is gigantic in size, crispness, taste, and juiciness. Now coated in velvety caramel, the apple is hand-rolled in the finest nuts and toppings. Sometimes it is covered in premium pecans. Other times they are coated in large cashews. Now and then it’s chocolate cookie and cream pieces. From time to time it is rich toffee that becomes the final layer. Maybe, even, it’s dipped or drizzled with milk, white or dark chocolate. Who determines the final toppings that our expert chocolatiers hand-apply to this apple? You do. Each gourmet caramel apple ordered from Mrs. Prindable’s is made to order to ensure freshness and delivery without delay. 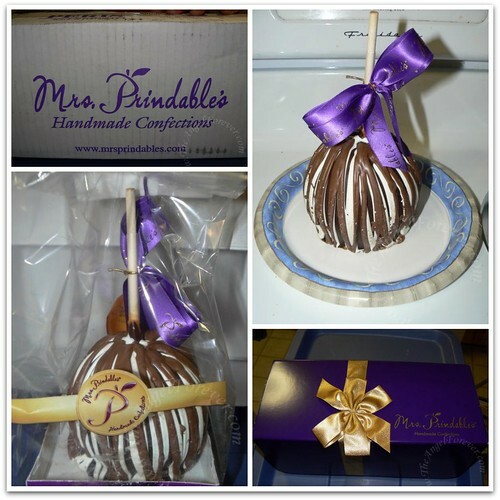 Mrs. Prindable’s offers their apples, along with gift baskets and items for all occasions. Right now there are great ideas available for Mother’s Day. 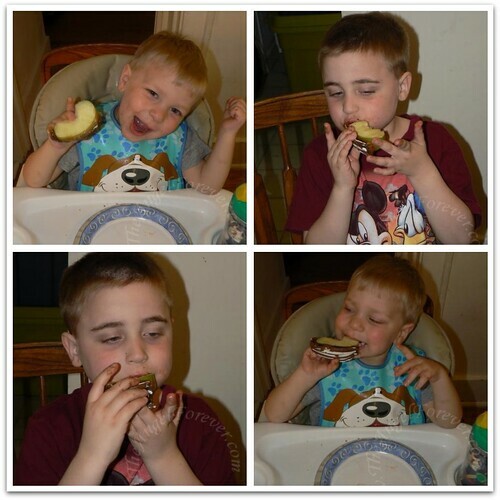 The pizza quickly took a back seat and the boys were chanting for some of the Mrs. Prindable’s apple that we received. TechyDad worked on slicing up the apple and getting them ready to serve. Below are the two boys eating them. We also took video (will share that another day) because they gobbled it up so quickly. 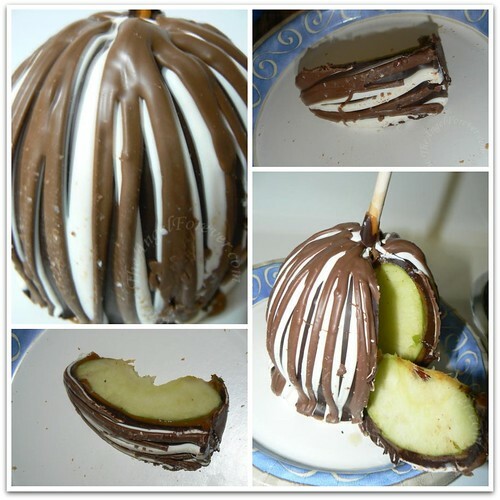 I am not a big chocolate fan, but, oh my, this apple was delicious. The Granny Smith inside was sweet, juicy and fresh. The caramel was rich, creamy, and still gooey (that’s a technical term). I must admit, that was by far my favorite part. The combined chocolates tasted almost like the apple was coated in an extra special fudge and drizzled with white chocolate on top. I think this is what sold the boys. My three chocolate addicts loved them. Before you knew it, the four of us consumed what should serve 8-10 people. Shhhh. . . . remember, it was after Passover and we were celebrating the fact that we were done with matzoh for a year. Another huge perk to us, the apple was certified kosher. This allowed us to use our big knives and not rely on plastic to slice through it. I know that we will definitely be getting more apples from Mrs. Prindable’s and it is something that I can send to our relatives that keep Kosher without a worry in the world. Thank you Mrs. Prindable’s for making such a mouth watering delight! Disclosure: I wrote this review while participating in a campaign for MomImpact on behalf of Mrs. Prindable’s. My family received a Triple Chocolate Gourmet Apple to facilitate our candid review. No other compensation was given and all opinions are from my family. .-= Simply Cathi´s last blog ..Project 365 – Day 108 =-. This would make an AMAZING Rosh Hashana gift. .-= Devo K´s last blog ..אני יהודי =-.